Optimus G will be the first Android device which will be coming with Jellybean 4.1.2 firmware. In this article, I will share with you a short tutorial about how you can make sure of the default/stock wallpapers on the position you want to take the stock wallpapers of LG Optimus G on your device based on the Android OS, on this section you will find with this. Download the Stock Wallpapers Package of LG Optimus G to your PC. Copy the wallpapers Folder in your smartphone’s internal memory. If your phone already has a folder “Wallpapers”, then you can merge the contents of the folder. Disconnect the smartphone from the PC once the folder was copied in your Android smartphone. 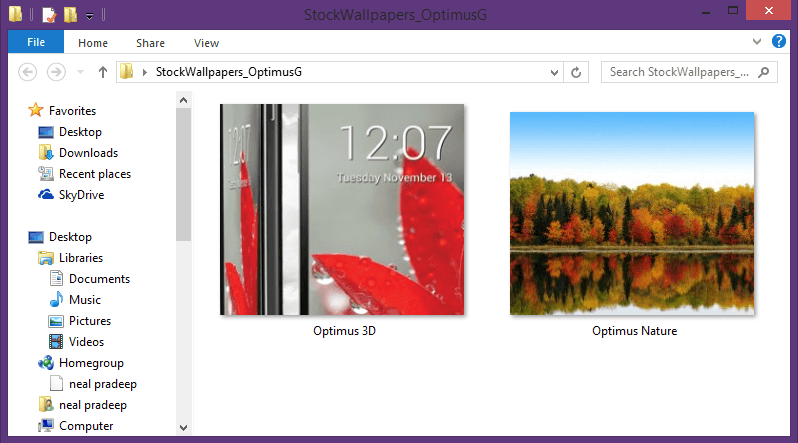 Navigate to the “Wallpapers” folder and choose what wallpapers you want and set the wallpaper as. Other methods to set the wallpapers is to open the wallpaper folder and after tap on the Menu button to set the wallpaper you like or you can use of ES File Explorer for the same thing. Now you learn how to Download Lg Optimus G wallpapers and set the wallpapers you want.